Anyone who has landscaped a yard understands the pain of moving. You can take the light fixtures, you can pack up the furniture, but the trees and bushes you leave behind. That’s how it was when we moved seven springs ago, and two trees in particular still haunt my memories of that great old bungalow on the corner lot just off 12th Avenue South. They were pawpaw trees, and I nurtured them like small needy children, building little canopies to protect them from the harsh summer sun during their first two years in the ground. And oh how they rewarded me. 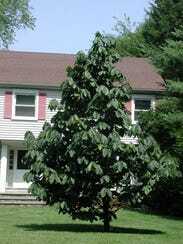 For all the time and care, I learned that pawpaw trees planted in full sun develop into beautiful cone-shaped trees, draped with large droopy leaves, and so much more majestic than their scraggly wild cousins in the forest understory. I learned that their deep maroon blossoms smell like fetid meat to attract certain flies and beetles to help with pollination. In late summer, they rewarded me with abundant fruit, astringent but sweet, with undertones of apple and banana pudding. When it was time to sell, I asked the young couple who would be moving in and starting a family of their own if I could come back and visit my trees, harvest the fruit and simply admire their growth. “Sure,” they chimed and for a while I did. But then signs of construction came, and an addition that nearly doubled the size of the house took up half of the back yard. The tulip poplar that towered above the roofline, a wedding present planted after our honeymoon, was the first casualty. Then the verbenas, whose top branches intertwined to create an archway over the fence gate, ended in a landfill somewhere. Somehow the pawpaws endured, until finally I got a Facebook message from friend, neighbor and fellow food writer Kay West. “Can you believe it?” she said, only with more colorful adverbs and unfettered urgency. I never got around to planting new ones in the new yard, and I don’t know why. Maybe it’s the memory of how much work they were to get established? Maybe my heart just wasn’t in it? We did inherit two stately tulip poplars, statuesque and four stories high. In the back, a tangled unkempt patch of thorny vines surprised us with black raspberries in May, and black locusts shower the woods behind us with fragrant white sprays. Then, a couple weeks ago, our neighbors Alan and Lee Marx surprised me with a sapling left on our front porch. The first time I met Alan seven years ago I mentioned that I was missing my pawpaw trees. He smiled and pointed up the hill to his house and said he had two trees. That’s pure lagniappe and a sure sign of a good move. Now, here he was, after all this time, presenting me with a thoughtful gesture and a call to planting. I don’t begrudge the folks who bought our house. I’m not bitter about their plant razing. The house is theirs now and they paid better than good money to live in a trendy part of town. And soon enough I will have a pair of trees, bearing fruit and cajoling me to find new and creative ways to prepare them. Then, when I’m gone, maybe someone will take that deed and share our love for native plants. Maybe, they will pull up and look at the house and see the trees for what they truly are. Those trees are beautiful! What kind of trees are they? 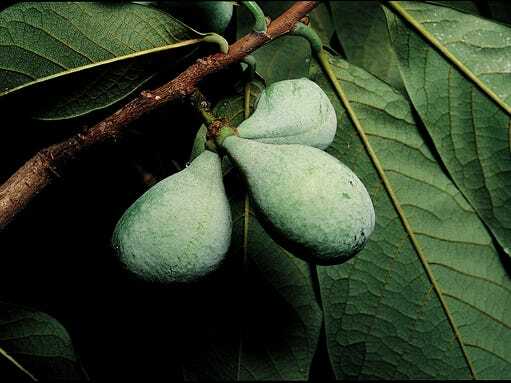 How does the Pawpaw fruit taste? Alex, the pictures are of Pawpaw trees. Check out the lastest blog post all about pawpaw fruit!